Mosquitoes are important vectors of diseases such as malaria, yellow fever, dengue, West Nile virus and encephalitis. Eliminating or treating the bodies of water that mosquitoes use for breeding is the best approach to controlling these insect pests. Just contact a professional at Midwest Exterminating. Asian Tiger Mosquito – Aedes albopictus. This mosquito is easily recognized by the white and black stripes on the legs and body. The Asian Tiger mosquito is an important carrier of the causative agents of West Nile virus, Saint Louis Encephalitis and dengue fever in humans, and heartworm in dogs. Larvae and pupa are aquatic stages in the development of all mosquitoes. Asian tiger mosquito females will lay eggs near any source of standing water such as rain barrels, bird baths, old tires, drainage ditches, knot holes in trees, etc. Elimination of these breeding sites is key to their control. 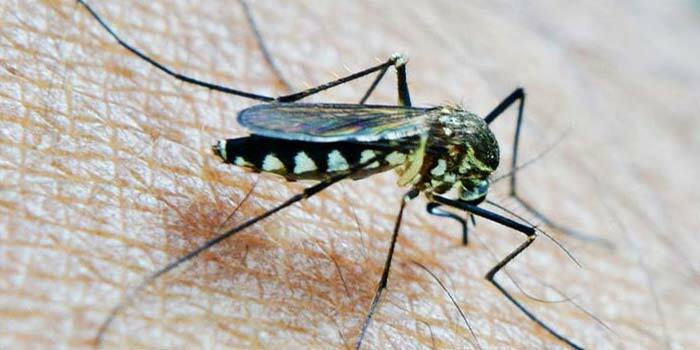 Yellow Fever Mosquito – Aedes aegypti. This mosquito can be identified by having white markings on the legs and the shape of a “lyre” on the top of the thorax. It is an important vector of dengue fever as well as the most important vector of yellow fever giving us its name. Found mainly in the southern United States and mainly in Florida, it is well controlled through efforts of the mosquito control districts found throughout the state. Encephalitis Mosquito – Culex tarsalis (Coquillet). The encephalitis mosquito is widely distributed west of the Mississippi River and is found occasionally farther east. It is the principal carrier or the Saint Louis Encephalitis and Western Equine Encephalitis viruses. This mosquito has a wide white band around the mid-point of the proboscis as shown in the picture. Malaria Mosquito – Anopheles quadrimaculatus (Say). The common malaria mosquito is found in the eastern and southern United States, west to the Dakotas, Kansas, Oklahoma and Texas. It breeds in permanent bodies of water where it is found in the shallows of such waters. They are very dark mosquitoes covered in dark brown to black hairs and have dark scales on the wings with patches of scales forming four darker spots on the wing.